Facebook’s New Reactions – What Do They Mean For Social Media? We already know that social media is potentially the greatest tool in any business' arsenal. That remains particularly true if you have the backing of an experience social media agency. A key part of any successful social media marketing strategy is ensuring that your business keeps up to date with the latest trends and developments. Changes are constantly being made to social media sites like Twitter, Pinterest and Facebook. In fact, it's Facebook that has recently undergone the most drastic change, expanding on its 'Like' function by adding six all new reactions. Facebook's new emojis are ways for your users to react to the content that you create and share over the social media platform. For a long time, the simple 'Like' option has been criticised for its lack of specification. Originally, Facebook users only wanted the addition of a dislike option to offer themselves more variety in reactions, but even these two are extremely limited in terms of authenticity. These reactions offer the potential for a much more rewarding engagement on behalf of the users, as well as increased analysis for businesses and official social media accounts. In order to gain context to likes, it required the users to take the time to comment on the social post. Although this is easier than ever in terms of speed, especially for mobile users, it can still be difficult to convince people to actually take the time to comment. Thanks to Facebook Reactions, people are now able to quickly and easily share their 'reaction' to the content or news story and express emotion without having to bother typing out a comment. Each one of these reactions has the potential to really change the face of using Facebook for social media. If these reactions do turn out to be a major success, there's no reason why other social media platforms, including Twitter, Pinterest, LinkedIn and many more, might not choose to implement something similar. How Are People Using Facebook Reactions? The newest reactions include 'Love', 'Haha', 'Wow', 'Sad' and 'Angry', and already it's easy to see how these features are starting to change the face of online interaction. 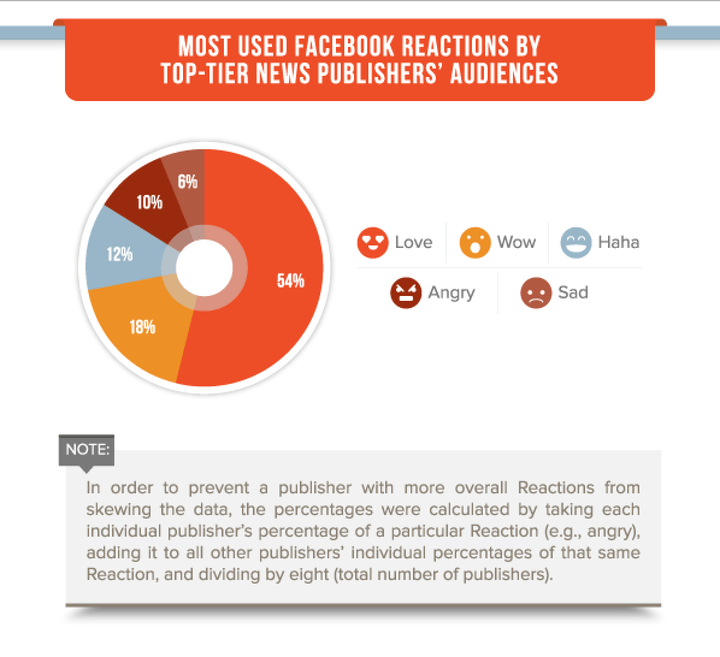 A recent study has discovered just how people are using the latest reactions to engage with content posted by top-tier news publishers. The study discovered that more than half of all new emojis used are 'Love', with 'Sad' being the least popular option. This is a great indicator as to the kinds of content that people are likely to be interested in, and that most social media users will actively avoid bad news in order to focus on the happiest content. It's also evidence of Facebook's cultural and intrinsic preferences for positive and upbeat news. How Can Facebook's Reactions Disrupt Your Business? Each of these reactions can be a great indicator as to what your users and potential customers think about the content that you've shown. They can impact your business' social media and eCommerce presence in a range of ways. Today, people don't seem to think that the 'Like' button is enough. As language has changed, people are now a lot more confident in saying that they love something. In most circumstances, you're going to want to try and obtain these 'Love' reactions as often as possible, as they are much more emotive and interesting than simple likes. If anyone clicks 'Love' on a business' post, then it's likely that the user is either a returning customer, or will become a customer very shortly. Either way, it's a public and rewarding vote of confidence which can really help to appeal to more users. Of all the new emoticons, this is the reaction which offers the highest potential when it comes to abuse or trolling. If you post something serious or troubling, and someone responds with a 'Haha' it can be difficult to deal with in a professional manner. However, it's designed to express humour or pleasure at a joke or an otherwise funny piece of content. If you post something serious that someone laughs at, you need to try and understand why. If it's trolling, then you can usually just ignore it, but if there's a real reason, you need to make sure that you get to the bottom of the issue as soon as possible. Similar to the 'Love' option, this reaction is usually used to express joy over a piece of news or content. This could be anything from a service or product announcement, a milestone or other amazing company news. This reaction will normally deserve a follow up from the most engaged social accounts, but be careful; it's all too easy to see this reaction being used sarcastically. Customers are able to express an unrivalled range of emotions over social media, all at the press of a button. The sad reaction can be used to great effect when your potential customers choose to interact with you. Whether you're announcing the end of a product or any other negative news, the sad reaction can a great way to get a real understanding of the way your followers think about certain products that you offer. Of course, knowing the younger social media users, there's every chance that people will click on the sad reaction in a sarcastic way. One of the largest benefits of a reliable social media agency is that they'll be able to spot whether a reaction is genuine, or used to troll your business. Most people will use the angry button to agree with a post, rather than express anger at the post itself. If you write a piece of content about something that you are legitimately angry about, it can easily gain angry reaction on social media and help to build a sense of solidarity around your business. What Can The Latest Facebook Reactions Mean For Digital Marketing? Now that your users have more options when it comes to reacting emotively to your content, including images, videos, ads and status updates, your need to be certain that you know how to react. Your social marketing team needs to adapt if it hopes to remain effective in the modern world of Facebook, Twitter and the rest. The use of reactions allows marketers to gain a much deeper understanding about their customers' opinions. This is particularly true when it comes to new stories and other forms of informative content. Before the introduction of these reactions, brands were forced to crawl through user comments for negative and positive expressions in order to understand what people really thought and why they thought as they did. Facebook posts aren't as open as Twitter, and it can take a long time to truly understand the reaction to any form of content if it receives a lot of attention. Tracking sentiments through Facebook have always been more difficult, particularly in any kind of easily or realistically scalable fashion. With these reactions, all kinds of social and digital marketing specialists can drastically increase their social efficiency and increase their return on investment. The previously unquantifiable metric has shifted, through these new emotions, into an easily measurable and presentable dataset. For brands and businesses, the new Reactions system can allow them to evaluate the kinds of content they are creating and sharing. When it comes to creating a meaningful experience for every single customer, this is a perfect tool. It, too, can really humanise your brand and become a fantastic indicator of marketing success. With these reactions, social marketing specialists can engage customers on a much deeper level and reap the benefits of doing so. Emotion is the driving force behind any organisation's social success – these reactions are the perfect way for businesses to effectively analyse and encourage engagement with all kinds of content. To gain the most benefits from Reactions, it is important that brands actually want to engage with their customers. Once the user has reacted to a piece of content, it's the perfect opportunity to engage on a one-to-one basis and let them know that you share their excitement, sorrow, anger or humour at a piece of content. Customer involvement drives customer commitment to a brand which, in turn, leads to company loyalty, brand awareness and increased sales. The administrators of social pages can do more than see engagement. Today, they can view intent in a way that has never been possible before. We've already established that these reactions are a great tool of marketers and social analysts to understand intent as well as engagement. However, all brands and companies need to be careful of how much value they place on this information. Any social media agency worth its salt will tell you that using Facebook's emojis aren't a very specific way of analysing engagement. These emojis can still be taken out of context and it can be difficult to analyse them as a truly specific indication of reaction. The bottom line for all organisations needs to be that they can't completely rely on reactions how their customers really feel about them. Although they are great for users on the move or who are looking for a quick way to react to something, by their nature they are much less informative than comments. There are already discussions over the role that each of these reactions plays in social media. 'Wow', in particular, has attracted a lot of discussion as to whether people think it is designed to be used sarcastically or not . That's the 'Wow' as in “wow... are you kidding me?" and not the 'Wow' as in “Wow... that squirrel really CAN water-ski!". However, thanks to their low requirement in terms of effort and time, these emojis can be an incredible way for brands to engage with users who might not identify with the like/dislike ideas of historical Facebook use. As one of the UK's leading SEO and social media agencies, we firmly believe that this is a great step forward for Facebook and a giant leap for social media as a whole. Here at Promote, we are dedicated to providing comprehensive marketing strategies which support and advance businesses across a full range of digital platforms. Whether you're looking for an established team to improve your website's search engine optimisation, advertise your business through the best pay-per-click advertising or increase engagement through social media marketing, Promote is the perfect choice for you. We believe in results-driven marketing, with a focus on customer experience and increasing traffic to your website, as well as footfall to physical retail outlets. For more information on any of the fantastic services that we can provide, or to take advantage of the best social media agency in the UK today, get in touch with our friendly team of marketing professionals on 0845 050 2500. You can also get in touch with us on Twitter, by tweeting us directly @promote_agency.